Killer Characters: What do You do When Stressed? What do You do When Stressed? What do you do when you're stressed? 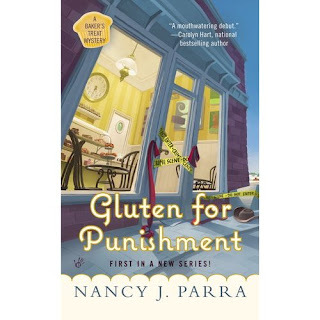 By Toni Holmes from Gluten for Punishment the first in the Baker’s Treat Mystery series written by Nancy J Parra. Hi, I’m Toni and I’ve recently moved back to my home town of Oiltop, Kansas. You see I was living in Chicago and developing my on-line, gluten-free bakery when two things happened within months of each other. First I caught my (now ex) husband with his best friend’s wife…in my bed. Then my mom got terribly sick and died leaving me the family homestead – a seven bedroom Victorian house filled with relatives who treat it like it's their own home. So I returned to Kansas to claim my place in Oiltop. I never felt as if I fit in this small town and things haven’t gotten better with age. But that doesn't mean I won’t try to make the best of a situation. Since rent downtown was cheap, I thought it would be a great time to open an actual storefront for Baker’s Treat, my on-line, gluten-free bakery. Who knew that the local wheat farmers would be offended by my bakery? A few pranks were one thing, but when people were murdered I knew it was time to fight back. The real trouble started when Grandma Ruth tried to help and then there was the complication of my handsome lawyer and the equally handsome, local widow with a perchance for gluten-free baked goods. Question: How does a girl stick to her business plan when everything that could go wrong does? All this madness causes stress. What’s your favorite thing to do when you’re stressed? Mix dry ingredients in heavy saucepan. Stir in milk. Cook and stir over medium heat until thickened and bubbly. Cook 2 min more. Remove from heat and stir in butter and vanilla until the butter melts. Pour into bowl cover with plastic wrap and chill. I serve this both warm and cold depending on my mood. Wow Toni, that sounds like a lot of problems. Stick to it and bake whatever you want. When I'm stressed, I turn on my embroidery software and draw designs to send to my embroidery machines. Oh, Willow, that sounds like a lot of fun! When I'm stressed I read. Leave my troubles for a little while and step into someone else's world. Reading is fabulous for stress. The best part is my character stress might actually help with your real world stress. How's that for awesome? When I'm stressed, I put on a good movie that will make me laugh. If that doesn't work, I get one of my favorite books and go into their world of make believe. So Toni, did you get rid of the relatives that were in your mother's house? BTW, I love the name of your town. I love movies - the movie theater closed a few years back. We have to go all the way to Wichita for the cinema... So instead I go to the Oiltop Library and check out movies...library movies are the best!! As for the relatives in my mom's house- ha! No, they come and stay as long as they want. It was part of the deal when I inherited the house. My bff Tasha thinks I should turn the house into a B&B and charge the family. I think my mom would roll over in her grave. lol. First I put on some good music, lately it's been some golden oldies. Then I may get on my elipitical for a few minutes to get rid of some nervious energy, then I either get on the computer or read a good book or a little of both. BTW I just wanted to thank you for the pudding recipe. I'm diabetic and allergic to nutrasweet which is in all of jello's sugar free puddings so this way I can still have chocolate pudding.